Frank Granieri and Angelina Arnone immigrated to America from Italy. They came to America separately as strangers, and became citizens at different times. In Ohio, the two met, fell in love and got married. 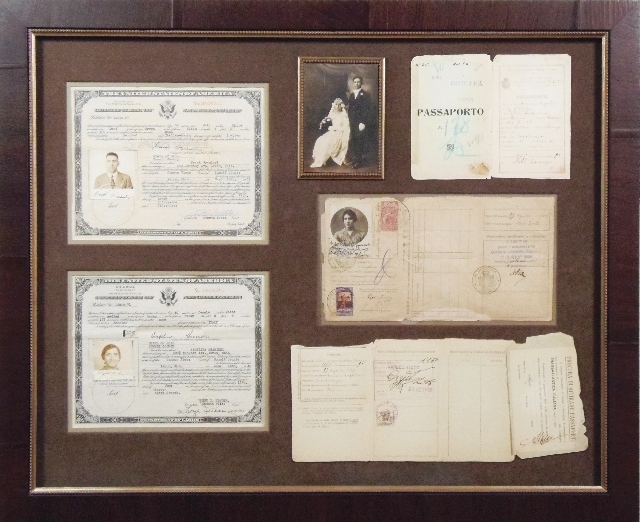 This framed arrangement includes their wedding photo, Angelina’s passport and both of their citizenship documents. The entire original passport was encapsulated (kept intact and removable). Surrounding the original are reproductions printed on fine art paper with coloring as authentic as the original. Besides custom framing with Bradley’s award winning designs, having original family mementos professionally reproduced is always a good idea for preservation! This entry was posted in Custom Framing Designs and tagged Citizenship, Custom Framing, Documents, Italy. Bookmark the permalink.